As it’s summer, it’s time for another of my letters from America, where Netflix and numbers are dominating the conversation. The former keeps steaming ahead with remarkable growth, with its current subscribers now hitting 48 million, including an estimated 3 million in the UK. Netflix’s sub number is already bigger than HBO’s and in the past quarter, Netflix’s subscription revenue surpassed HBO as well. The important caveat is that HBO’s profits in the past quarter were seven times larger than Netflix’s. HBO is far from being written off and it has also come up with a zeitgeist-ty idea: a kind of halfway house towards attracting the Netflix audience. HBO Go is a service that allows subscribers to watch great shows like Game Of Thrones on any of their mobile devices. Of course, that’s neat for the kids who seem to ONLY watch stuff on smartphones or tablets. 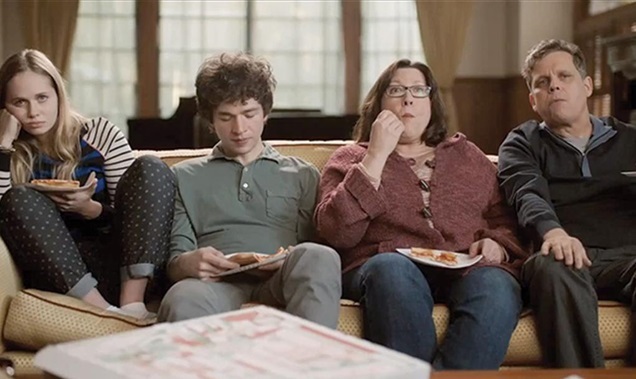 In fact, the HBO Go adverts in the US (pictured) are hysterical, revealing how embarrassing the kids find it watching TV with their mums and dads - the solution, the advert says, is HBO Go. Have a look on YouTube - it’s worth it. The problem is that the prospective new, young HBO Go subscriber still needs their parents (or someone) to pay their normal HBO cable subscription. It’s a buy-through as opposed to a standalone service. HBO Go is a definite nod to the Netflix generation, but it shows just how hard it is for traditional broadcasters and content providers (and HBO would not have fitted that description even a decade ago) to adapt. In fact, Sky’s Now TV option is a better fit for the millennials because the service does not need anyone to have a Sky subscription; it’s a month-to-month, all-device-friendly idea that might just attract the anti-big-bundle audience. But it doesn’t have all the best stuff that’s on Sky, only a subset. Think how much easier it is for the newer players to find the young ‘uns with compelling video content. YouTube has always been in the vanguard of this kind of short-form material, but Netflix, Amazon and a host of others are lining up with their own offerings and their own commissioning budgets. Take Buzzfeed, the zingy, list-based website best known for its five-things-you-never-knew-about themes. It has just received an investment of $50m (£29.8m) from venture fund Andreessen Horowitz, which reportedly values the site at a cool $850m. So what will it be spending its cash on? Video is at the top of the list. Like Netflix, Buzzfeed is not slowed down by an urge to protect legacy revenue streams, and has already set up Buzzfeed Motion Pictures for the purpose of making the best content available. Like House Of Cards on Netflix, Buzzfeed will surely soon announce a breakthrough show or movie for an audience that doesn’t want an expensive and long subscription, and get its viewing recommendations from social media, where Buzzfeed is extremely strong. If I were in the TV business, I wouldn’t be studying what my traditional rivals are doing as much as checking out the next newcomer with a fistful of dollars and a no-limits agenda.